You and your loved ones deserve to live life to the fullest! At Port Arthur Chiropractic Centre, Thunder Bay Chiropractor Dr. James DiGiuseppe focuses on family, welcoming all ages to experience our unique approach to health care. 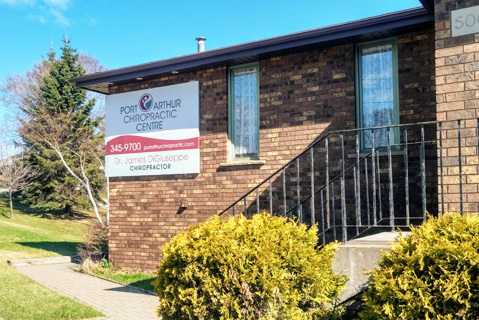 Through specific and tailored chiropractic care, Thunder Bay chiropractor Dr. James DiGiuseppe and the entire Port Arthur Chiropractic Centre team aims to help the community feel better and maintain a level of wellness that allows them to get back to doing what they love. In our warm and inviting atmosphere, you’ll feel right at home and know that we offer the perfect place to start your healing. Chiropractic can be seen as the facilitator that allows your body to work at its highest levels. When your nervous system functions optimally, you can better adapt to the everyday stresses of life. The true purpose and value of chiropractic care at Port Arthur Chiropractic Centre is to enable you to do the things you love. Find out why our patients love the health care we provide at the Port Arthur Chiropractic Centre by taking a look at the testimonials page! We look forward to helping you on your journey! Contact us today to arrange a consultation and see if you would make a good candidate for chiropractic care. Through crafting custom treatment plans unique to each patients needs, Port Arthur Chiropractic Centre has more than 20 years of experience helping families get well and stay well through chiropractic care. Get to know more about our Thunder Bay chiropractic team and how he can help you! Dr. James has helped me heal naturally! I regret not starting sooner! Everything in my life has been positively affected.